Usually I won't review a book on Rock and Roll, but this one is a gem. Being a Stones fan probably has alot to do with it! I do read celebrity autobiographies but consider them a kind of selfish delight. Ok- I'm a literary snob- but this book rocks! For those who don't know of Bill German, a little background- he ran the Stones "fanzine" Beggars Banquet for 17 years - started it in his bedroom in Brooklyn, NY. (Another reason I like this book) He was a student at South Shore High in Canarsie and began the publication on a school mimeograph machine. From there he started handing the thing out to whoever would take one- staked out the hotels where the Stones were staying- got a copy in Keith Richards hands and eventually became embedded with the band- making all the tours fron 1978 to 1995. 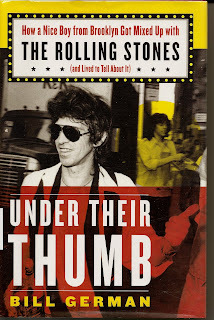 Along the way he became friends with the Stones and this book offers a rare and unusual look at the concert promotion game as well as inside band politics. Great insights into the Stones family and personal life- the emphasis here is not only on the drugs- this is about the business end of the show- and also the music. If you want the kiss all tell all stuff read Ron Woods' autobiography "Woody." A great read in itself- but this one goes beyond the sensationalism. I could sample you some of the great stuff in this book- but if you are a Stones fan- you are going to want to read this for yourself. It is a self made sucess story that could only come out of Brooklyn. A delightful read.